In order for a gift deed to be valid they must meet the following requirements: The grantor must intend to make a present gift of the property, the grantor must deliver the property to the grantee, and the grantee must accept the gift. A gift deed must contain language that explicitly states no consideration is expected or required, because any ambiguity or reference to consideration can make the deed contestable in court. A promise to transfer ownership in the future is not a gift, and any deed that does not immediately transfer the interest in the property, or meet any of the aforementioned requirements, can be revoked . A lawful gift deed includes the grantor's full name and marital status, as well as the grantee's full name, marital status, mailing address, and vesting. Vesting describes how the grantee holds title to the property. Vermont recognizes the following types of joint ownership: tenancy in common, joint tenancy, and tenancy by entirety. A grant of ownership of real estate to two or more unmarried persons is presumed to create a tenancy in common, unless otherwise specified in the conveyance. A conveyance to a married couple vests as tenancy by entirety (27 V.S.A. 2, 27 V.S.A. 349). In Vermont, an instrument may create a joint tenancy in which the interests of the joint tenants are equal or unequal (27 V.S.A 2). As with any conveyance of real estate, a gift deed requires a complete legal description of the parcel. In Vermont, a deed that refers to a survey revised or prepared after July 1, 1988 may be recorded only if it is accompanied by the survey to which it refers, or cites the volume and page in the land records showing where the survey has been previously recorded (27 V.S.A. 341). Recite the source of title to establish a clear chain of title, and detail any restrictions associated with the property. Record the completed deed, and file a copy of Act 250 Disclosure Statement with the Town Clerk, who shall record it in the land records (10 V.S.A. 6007). The fee for recording a real estate document in Vermont, the fees are $10 per page for all documents recorded. Copies of recorded documents are $1 per page. Certified copies are $1, plus the per page costs (32 V.S.A. 1671). All deeds conveying property with or without consideration must have a Vermont Property Transfer Tax Return (32 V.S.A. 9602). There is a $10 filing fee for this form. When filling out the Transfer Tax Return form, make sure that section B is accurate and clearly printed. This information provides data needed to update that parcel's owner information for all city departments. Do not send property tax payments with documents to be recorded. Those payments should go directly to the Treasurer's Department (32 V.S.A. 9602). The grantor is responsible for paying the Federal Gift Tax. The IRS implements a Federal Gift Tax on any transfer of property from one individual to another with no consideration, or consideration that is less than the full market value. In accordance with federal law, individuals are permitted an annual exclusion of $14,000 on gifts. This means that if a gift is valued below $14,000, a federal gift tax return (Form 709) does not need to be filed. However, if the gift is something that could possibly be disputed by the IRS -- such as real property -- a grantor may benefit from filing a Form 709 . In Vermont, there is no state gift tax. For questions regarding state taxation laws, consult a tax specialist. 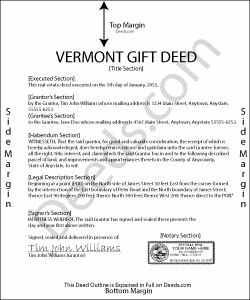 Gifts of real property in Vermont are, however, subject to the federal gift tax. The grantor is responsible for paying the federal gift tax; however, if the grantor does not pay the gift tax, the grantee will be held liable .